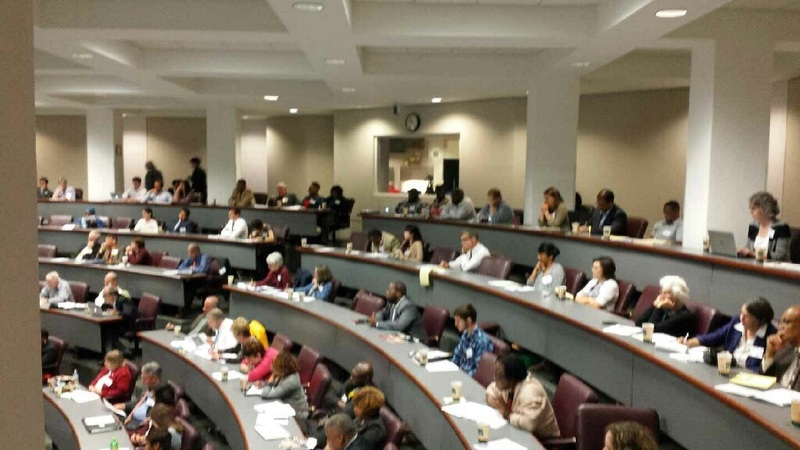 Last week I had the great privilege of attending NC-CRED’s symposium on Understanding and Dismantling Mass Incarceration in North Carolina. The symposium brought thought leaders, activists, legislators, judges, lawyers, and others together to learn from one another not only about the problem and current status of mass incarceration in our state, but about real solutions for reforming our broken criminal justice system. I left the event swimming in new information and new ideas—and was so incredibly encouraged by the amount of energy in the room to not only envision but implement a different reality for North Carolina. We need to dismantle our current school to prison pipeline by curtailing the role of police and school resource officers (SROs) in our schools—and that means thinking about alternatives to SROs and how they are currently engaging in our schools and with our students. Increased numbers of SROs in our schools has resulted in increased suspensions and expulsions, increased drop-out rates, increased court involvement…without an increase in overall student safety. We need to Raise the Age. North Carolina is one of only two jurisdictions left in the country that automatically treats all 16 and 17 year olds as adults in the criminal justice system. And with the exception of an innovative diversion program in Durham, we haven’t been able to move the needle on this issue, despite years and years of trying. It requires a legislative solution, and we need a diverse coalition of stakeholders to get it done. We need the DAs and law enforcement to get behind this effort. We need the governor to get behind this effort. We need leaders in the House and in the Senate to get behind this effort. Because y’all, this is outrageous. We are going to have to engage in real sentencing reform—not just for low-level drug offenses, but for violent crimes. We have to believe in redemption. I’m not naïve enough to think this is going to be easy. This one is going to be tough political sell. But after all that I heard last week, I have a new appreciation for how vitally important this piece is to realizing a meaningful reduction in the number of people behind bars in our state. Reinvestment is critical. When (not if—when) we reduce our prison population, we’re going to save a lot of money. That money needs to be reinvested in community services and supports for vulnerable people—especially those in need of mental health services. It is news to no one that North Carolina has long history of promising change and choice and better options for people with mental illness in our state…without delivering on those promises. We have to do better, or all the work to end our current rates of incarceration will be for naught. We know about the problem, and we know what it’s going to take to fix it. Let’s get to work.